Sailrock has all the best parts of a resort vacation: activities, excursions, fine dining, and a spa, all without the crowds and chaos of a commercialized resort. 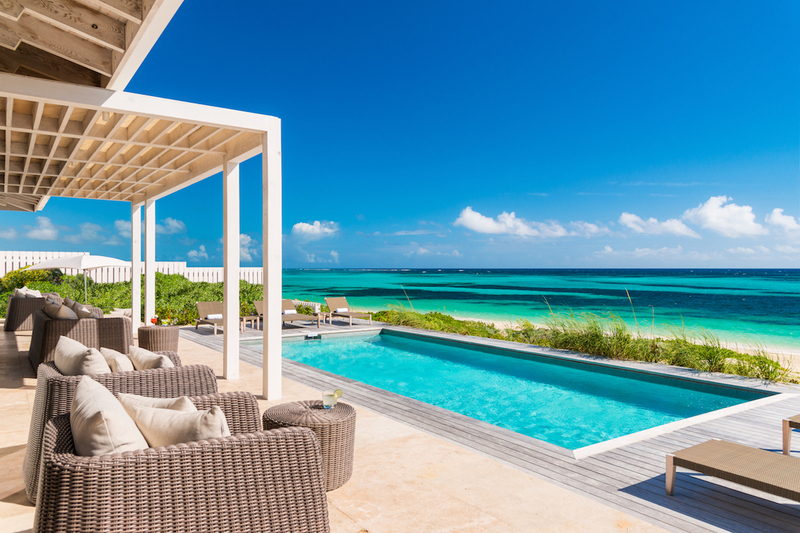 The villa sits on South Caicos, an undeveloped island off the coast of Providenciales. Try the resort’s paddle boards, hobie cat, and kayaks for a day on the high seas. Sailrock Resort Beach Front Villa is located on the secluded southern coast of Turks and Caicos. This villa is elevated above a long stretch of untouched beach, and has direct ocean access. The villa’s main terrace holds the oceanfront pool and lounge chairs, and blends with the garden’s sitting area. An outdoor living area rests under the pergola, which is connected to the Great Room. There’s also outdoor dining and seating in the courtyard, on the other side of the Great Room. Guests can visit the resort’s fitness center and spa for a change of pace. The Great Room faces the sea and holds the living room, dining table, and gourmet kitchen. The living area has ample seating, and the kitchen has all the equipment for a feast. Each of the three bedrooms are equipped with king beds, his and her closets, and ensuite bathrooms with dual vanities, oversized walk-in showers, outdoor shower gardens, and soaking tubs. Two bedrooms lie on either side of the Great Room, and one is by the entryway. Sailrock Resort’s restaurant, The Great House, offers classic fine dining with a Caribbean flair, and the Great House Bar offers drinks with an ocean view. Guests can relax at the spa or go on an excursion: whale watching, conch diving, and kite boarding are a few options. Rates do not include: tax of 12%, island charges of 10%. Upon arrival guests will be met at Providenciales Airport by a member of Sailrock Resort to board the Island Hop Flight to South Caicos Airport. (XSC) A ground transfer will be waiting for guests to take them to the resort. Island Hop Flight, ground transfers to and from the resort, signature welcome cocktail, fresh fruit, complimentary breakfast, access to fitness center, books and DVD library, daily newspaper through Press Reader, non-motorized water sports activities, and private check-in. Car rental, private chef, butler, server, grocery and beverage shopping (pre-arrival and during your stay), liquor and wine delivery, nanny service, baby equipment, spa services, yoga and personal training, photography, and private airport transfer/car service can be arranged for an additional fee. Discount of 35% off rental rate. Applies to bookings 3 nights or more. -Breakfast, Island Hop upgrade to charter flight from PLSS to XSC, and transfer from XSC to the resort is included. -This offer is valid on new bookings and cannot be combined with other promotions. Black out dates may apply. Good for stays from Apr 29, 2019 to Sep 3, 2019. Must book by May 16, 2019. This promotion is valid for new bookings effective April 5, 2019, and may be combined with the Luxury Spring into Summer Sale percentage discounts WITHOUT the added value of an upgrade to the charter flight as listed under Summer Sale promotion. Good for stays from May 1, 2019 to Dec 21, 2019. Must book by May 15, 2019. 2019 Summer Sale - 35% off! This offer is valid on new bookings and cannot be combined with other promotions. Black out dates may apply. Good for stays from Sep 4, 2019 to Dec 21, 2019. Must book by May 16, 2019. Spring Into Summer Special 30% Off! Discount of 30% off rental rate. Applies to bookings 3 nights or more. Good for stays from Jan 30, 2020 to Feb 12, 2020. Must book by May 16, 2019. Discount of 20% off rental rate. Applies to bookings 3 nights or more. Good for stays from Feb 13, 2020 to Feb 20, 2020. Must book by May 16, 2019. Good for stays from Feb 21, 2020 to Apr 18, 2020. Must book by May 16, 2019. Specials subject to availability and/or change at any time. New bookings only. Blackout periods may apply.